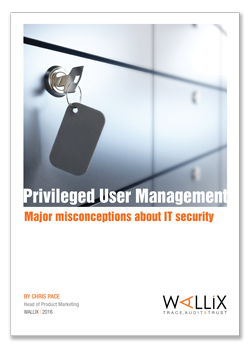 Download “ Privileged user management : serious misconceptions "
Perimeter security - via firewalls, IPS/IDS or VPN, is mostly well-understood and well-implemented. However, it often fails to take into account the risk of privileged user rights (such as external providers and internal administrators) on the network. Here are five major misconceptions about IT security, which, if unfixed, can lead to bad protection.